Within the pages of Dan’s first book, Way of the Peaceful Warrior, Socrates sends Dan out into “the fires of daily life” to learn what he must. During this time of difficulty and disillusion, Dan’s is given a grant to travel around the world. Sacred Journey relates the first part of his travels, as Dan searches for a mysterious woman shaman in a Hawaiian rain forest to find a critical clue that will direct him to a hidden school-the next step on his journey. In the process, he learns the secret of the three selves and experiences the tower of seven levels, finding joy and grief, insights and love as he explores the hidden realms of the mind, the body, and the spirit. I first intended to write a small book about “awakening the three selves.” But this story appeared, and my fingers started typing. 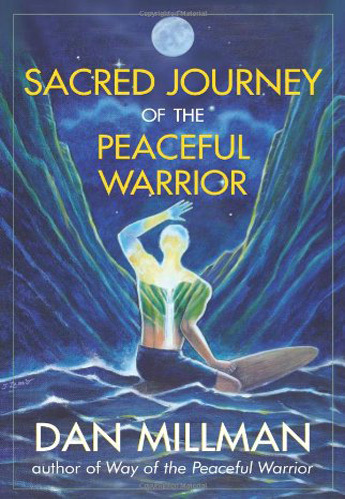 Written ten years after Way of the Peaceful Warrior, and reflecting new and hidden teachings I had since learned from an unusual teacher, Sacred Journey takes readers to a deeper understanding of our lives.